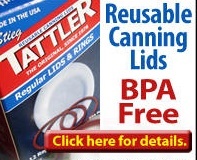 Looking for Replacement Canning Lids and Rings - including reusable, disposable lids and rubber rings in 2019? Scroll down this page and follow the links. And if you bring home some fruit or vegetables and want to can, freeze, make jam, salsa or pickles, see this page for simple, reliable, illustrated canning, freezing or preserving directions. There are plenty of other related resources, click on the resources dropdown above. Scroll down this page for canning lids and rings, both disposable, reusable and rubber rings, along with photos, descriptions, prices and ordering information. Everything can be shipped by a variety of methods, including overnight, if you have a canning emergency! Note: In response to requests for canning products and books, I've added this page, and I've found reliable suppliers for the products here, and now at even lower prices - I'll bet you can't beat them anywhere! And I appreciate your business- buying the products here helps support the website! Need lids, rings and replacement jars? Or pectin to make jam, spaghetti sauce or salsa mix or pickle mixes? Get them all here, and usually at lower prices than your local store! Click on the images at left for current prices and/or ordering! Now there is a safe, economical reusable, canning lid. BPA-free and reusable. I have personally tested these myself for the past 6 years. They are every bit as effective and reliable as the disposable metal lids. And safer - they cannot corrode and have no laquers nor BPA. I have no connection to the company; I'm selling them here because I believe they are a good, safe, reusable lid! Comments from a visitor on September 15, 2010: "You mention not using jars that have rust on them. One way to remove rust from jars is with Copper Glo. I get Copper Glo at our local Giant Eagle. I had a jar with rust on it and was getting ready to pitch it when my mom told me about Copper Glo. I was afraid to use it at first because I was afraid it would scratch the jar, but decided it was worth a try. Amazingly, the rust came off and the jar wasn't scratched!" Rubber seals for the older zinc caps - Know first that home canning experts do not recommend that you use the rubber ring system. The modern flat lid and metal ring system (above) is superior in reliability and safety. If you insist in using the rubber ring system, do not use old rubber rings: they have aged and will probably not seal effectively, especially on an older jar. You can get new rubber canning rings quite inexpensively here.. Note: There are even rubber gaskets at left for Kilner jars for those of you in Europe - or brought your Kilner jars with you! 1. The Complete Home Canning Kit - Around $65 This is the canner and complete kit - everything you need in one package. It is also the same make and model that my family has used for 3 generations - my grandmother made everything from applesauce to jams and jellies to tomato and spaghetti sauce with it! Further description: Ball Home Canning Basics Kit - Let Ball show you how simple home canning can be. The Ball Home Canning Basics Kit will give you all the basic utensils you need to start preserving the bounty of your garden or supermarket. 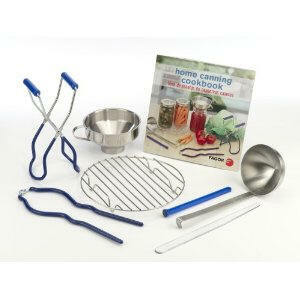 This Ball Home Canning Basics Kit makes canning so easy and is a great gift for the beginning home canner. 2. The same as the kit above, but without the jars, jar lids, Ball Blue Book and coupons. Around $20. There is a separate kit of supplies further down the page. The manufacturer does not recommend this canner for glass or ceramic top stoves as it does not have a flat bottom. However, our experience is that these water-bath canners work fine on "most" flat top stoves. Made of stainless steel, so it should last a lifetime - it would also make a great pot to cook applesauce.